A magistrate has ordered eight girls from Pakistan flown into the country as cultural dancers be kept in a safe house to enable police establish whether they are victims of human trafficking. 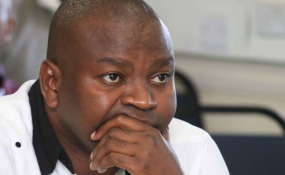 Senior principal magistrate Kennedy Cheruiyot sitting at the Milimani law courts gave the order after being furnished with special permits issued to the eight foreign girls by the Cabinet Secretary Sports , Culture and Heritage Mr Rashid Echesa Mohammed. Defence lawyer Evans Ondieki told Mr Cheruiyot that the eight girls who were arrested at Balle Balle Club in Parklands " are in the country legally with full permission of CS Echesa." Mr Ondieki said the eight cultural dancers from Pakistan were allowed to enter into the country by Mr Echesa to promote transnational cultures. The lawyer pleaded with the magistrate to release the girls to be detained in a safe house where police can access them whenever they want as they investigate the owner of Balle Balle Club who brought the girls to Kenya.
" On humanitarian grounds I urge this court to release these girls as they have not bathed for the last one week, health rules require women to freshen up and bath as many times as they can afford," Mr Ondieki told the magistrate. He said it was regretful that police are stifling the order of CS Echesa that allowed the girls to perform in Kenya up to January 18, 2019. He said each of the girls paid the Immigration Department Sh45,000 to be issued with the special passes. "What government are the police serving and what government is Mr Echesa serving? Aren't they serving the same regime," Mr Ondieki wondered. The magistrate released the girls to the custody of Mr Nadeem Khan, the director of Blue Heart, a non-governmental organization that specialises on human trafficking, violence and child abuse. Mr Khan is to place the girls in a safe house where "only him and police can access the girls for interrogation." Only police from the transnational crimes desk can access the girls who are suspected to be victims of human trafficking. State prosecutor Ms Annette Wangia opposed the release. The magistrate directed them to appear in court on January 8, 2019 when the proprietor of Bella Bella Club Mr Safendra Kumar Sonwani and his manager Mr Mika Osichiro will be arraigned for prosecution of human trafficking. Mr Sonwani and Mr Osichiro were detained on Monday for interrogation over irregularly trafficking into the country the said eight girls.